From Africa to Oz: #Hack1000Miles goes global! When we launched #Hack1000Miles, we had no idea how far and wide this brilliant challenge would spread. Here is a collection of riders from around the globe who have decided to take on the challenge. Candy Chester, from Victoria, completed an incredible 100 miles in one week on her mare Miss ZZ. 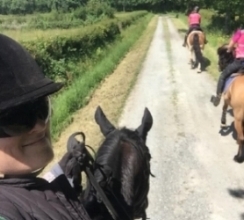 It is made all the more impressive by the fact that she is legally blind and follows the sounds of her guide rider Mat and his mare, River, out hacking. 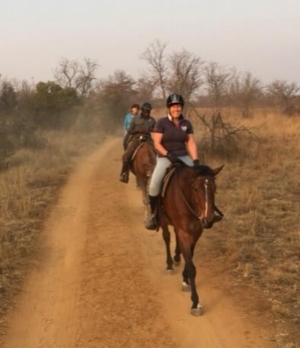 70 miles were added to Cassi Errington’s total during a trip to South Africa. She went animal spotting, swimming and galloping on steed Spearchucker Jones, who she credits for making the trip so memorable. Riding Marwari horses, a local breed with their unique ears, Cha Kingsman Chaudhary hacks out with her husband, who she convinced to join her in hacking 1,000 miles. They often come across water buffalo — perhaps a little scarier than your a deer or a cow! In Florida, the heat isn’t the best for daytime riding. Christine Rogers has said that Hack 1000 Miles has motivated her to ride more through the summer. “The weather is not really conducive to riding here, with high humidity, bugs and mud,” says Christine. Joanna Wallez took part in Randonnés, unguided rides, that can be anything from half a day to three days long, in the rugged French countryside. 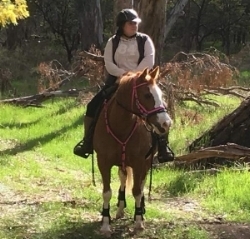 “It’s an amazing experience setting up your tent next to the temporary paddock you have created and going to sleep next to your horse,” says Joanna. Bettina Yockney completes 90km in four days riding in the back country of New Zealand. “We are so lucky to have such amazing places to ride,” she says.